The off-grid solar market is growing rapidly. In 2016 alone, an estimated 30 million off-grid solar products were sold globally. These products ranged from small portable lanterns to 100+ Watt solar home systems capable of powering TVs, fans and other appliances, with an average lifespan of 2 to 5 years, and sometimes as few as 18 months. While e-waste generated by the off-grid solar sector represents less than 0.1% of global e-waste streams, investment now will ensure the industry’s growth is sustainable over the long term and further enhance the sector’s reputation as a leader in environmental responsibility. Filling critical information and data gaps on corporate end-of-life product management. Addressing key logistical challenges faced by solar distributors related to take-back and collection of solar e-waste. Improving and strengthening operational processes at e-waste processing facilities to increase solar e-waste recycling capacity across sub-Saharan Africa, among others. CLASP is implementing the program in partnership with GOGLA. The program seeks to mobilize broader and long-term action among companies, investors, and policy makers to address off-grid solar e-waste. Individual funding awards range from $50,000-$200,000 to support the implementation of an innovative project over a 12-month period. The application window closes on May 15, 2019. More details about the Global LEAP Solar E-waste Challenge and the application forms can be found at www.globalleapawards.org/e-waste. About the Scaling Off-Grid Energy Grand Challenge for Development: Scaling Off-Grid Energy (SOGE) Grand Challenge for Development is a global partnership founded by the U.S. Agency for International Development, Power Africa, the U.K. Department for International Development, the African Development Bank, and the independent charity, Shell Foundation. 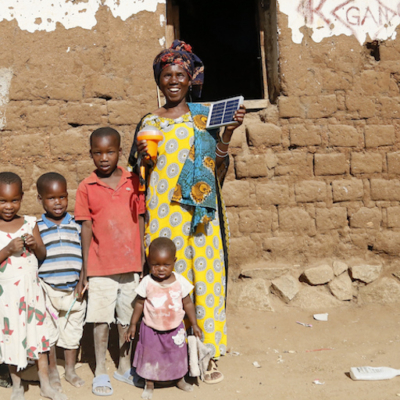 By optimizing the collective resources and expertise of its partners, SOGE accelerates the growth of a dynamic, commercial off-grid energy market to provide clean, modern, and affordable energy access to the millions of households and businesses beyond the grid in sub-Saharan Africa. About the Efficiency for Access Coalition: Efficiency for Access first kicked off in 2015 as a year-long call to action and collaborative effort led by Global LEAP & Sustainable Energy for All. Now, a number of donors have joined together under a scaled-up Efficiency for Access – a coalition promoting energy efficiency as a potent catalyst in global clean energy access efforts. Coalition programmes aim to scale up markets and reduce prices for super-efficient, off- and weak-grid appropriate products, support technological innovation, and improve sector coordination. Current Efficiency for Access Coalition members have programmes and initiatives spanning three different continents, 44 countries, and 19 key technologies. About GOGLA: GOGLA is the global association for the off-grid solar energy industry. Established in 2012, GOGLA now represents over 135 members as a neutral, independent, not-for-profit industry association. Its mission is to help its members build sustainable markets, delivering quality, affordable products, and services to as many households, businesses and communities as possible across the developing world. About the Global LEAP Awards: Global LEAP activities seek to transform the global market for off-grid energy products by harnessing the power of marketplace competition to drive technical and market innovations in the off-grid appliance sector. This unique program has evolved into a trusted global brand that serves as the de facto source of accurate, actionable information about the quality and energy performance of off-grid appliances. The Global LEAP program is implemented through the Efficiency for Access Coalition and managed by CLASP, with support from Power Africa, UK aid, Energising Development, Powering Agriculture, and USAID. Program partners include Ideas to Impact, IMC Worldwide, Energy 4 Impact, Acumen, Shell Foundation, and GOGLA.